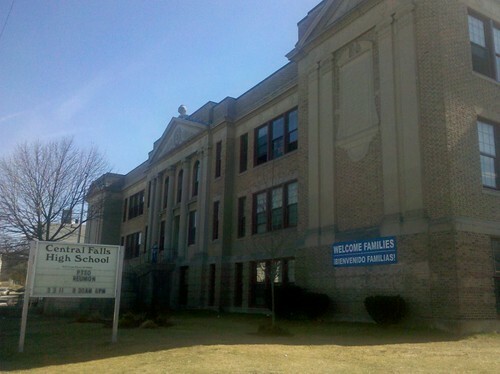 On Tuesday, I visited Central Falls High School in Rhode Island, where the administration and school board attracted major media and political attention last year when they attempted to terminate all 88 teachers, paving the way for a similar move last month by the new Democratic mayor of Providence, Angel Taveras. I wanted to check-in on how the school had progressed since its uncomfortable national debut. What I found was an admirable administration-led effort to seed a more rigorous culture of learning among teenagers in this economically stagnant, post-industrial city, which is currently under state receivership due to financial mismangement. But I also met teachers who described the faculty as demoralized and student discipline as a consistent problem. Before I get to the details, here's what has happened at CFHS over the past year: After additional negotiations with the teachers' union, the educators were allowed to return to their jobs without reapplying for them, provided they signed a letter agreeing to work a longer school day, offer more after-school tutoring, and undergo more stringent performance evaluations. Since then, about 20 teachers chose to retire or leave the school, and another 30 teachers and staff members are currently facing layoffs, 11 of whom are tenured teachers being terminated for poor performance (the rest are the victims of budget cuts). Adding to the turmoil at the persistently-underperforming school–just 7 percent of students are proficient in math, and less than 50 percent graduate on-time–is the fact that it is undergoing a federally-funded "transformation," with a new administration led by Victor Capellán, a veteran of the Joel Klein-led small school movement in New York City. I liked a lot of what I saw at Central Falls High School. On the morning I visited, 25 local professionals from law enforcement, business, government, and the non-profit world were meeting one-on-one with 60 juniors and seniors to discuss career goals. When Capellán and other administrators strode through the hallways, they were greeted affectionately by students; meanwhile, those who came late to school were welcomed at the door by a parent volunteer who smiled warmly, but also handed out behavior citations. Attendence and tardiness are major problems at CFHS; only about 18 students in a typical 22-person class will show up on any given day. There is a giant school-wide attendence-tracking chart in the front hallway, as well as a poster campaign suggesting "10 Ways to Get to School 10 Minutes Earlier." Four full-time "behavior specialists" comb the school's hallways with walkie-talkies, seeking out students who are late to class or cutting. Offenders are immediately sent into a dedicated classroom where they are handed a behaivor citation, several of which can lead to a detention or call home. During the day I spent at CFHS, I saw at least a dozen students roaming the hallways during classtime. But I also observed two very dynamic classes, one taught by chemistry teacher and soccer coach Carl Africo (pictured below), and the other by math teacher Anthony Kulla, a former graphic designer and public relations manager who entered teaching two years ago via the Rhode Island Teaching Fellows program. Kulla and his co-teacher, Adam Cherko, told me they had made good academic progress with their students, in part by totally renewing the math department's curriculum. When the 10th graders entered the classroom Tuesday afternoon, Kulla showed them a custom-made powerpoint slide, a proprotions problem about the price of a rare comic book, illustrated with a vintage X-Men cover. Spanish-language hip-hop played in the background as the kids took 10 minutes to find the answer. A student then volunteered to show her work on the whiteboard. "Make sure you have that down," Kulla emphasized. "Because we're going to do another one like it tomorrow and I want everyone to get it right by the time the music turns off." Despite their clear pleasure in working with the students, Kulla and Cherko said teacher morale throughout the building remains low, in part because of last year's termination crisis and the resulting high-turnover among staff, and in part because student discipline remains a major problem. "The kids, when they're here, need to know this is a place of learning," Kulla said. "Right now they don't." Cherko added that the layoff crisis was interpreted by many students as a sign that their teachers were incompentent. "I'm not sure they realize how nationally-driven what happened last year was," he said. "They say, 'The teachers got fired because they're bad at their jobs.'" The Central Falls administration certainly seems hard at work attempting to improve discipline and attendence; the fact that the numbers remain problematic show just how difficult it is to revitalize a school's culture. The termination crisis, unfortunately, probably worsenend the problem by sending students and their parents the message that CFHS teachers are not respected professionals. Providence police lieutenant Daniel Gannon was one of the volunteers visiting CFHS Tuesday morning to mentor students. Gannon told me he hadn't known much about the school in advance except that "there was a big teacher issue here. From what I understand, they weren't performing up to standards." But he also told the students he met with never to judge an entire profession by one bad apple. "I treat people the way I way I would want my family members treated by a police officer in another city or state," he said. "In every profession you unfortunately run into people who don't care–teachers, cops, every profession." This entry was posted in Education, Politics, Poverty on March 18, 2011 by Dana Goldstein. We’ll never know whether the events of the past year have helped or hurt Central Falls. It has always had strengths and in particular had three years of steady growth in reading scores until they dipped this year. Also, I’d find it reassuring if everyone who came from outside to Rhode Island to visit this school would point out first that the entire idea of a one square mile district composed at this point almost entirely of low income immigrant families is just mind-bogglingly ill conceived. I grew up in CF and graduated from their. There have always been students that didn’t care, and teachers would somewhat also care less. I believe that the teachers need to enforce more rules and make sure that students are there and participate. I also beleive that because of the demographics of CF in general, there is very little parent involvement because parents themselves came here from a different country in which the school system is completely different. One of the reason reading and math scores may be so low is because not enough emphasis is placed on the importance to read in english. A huge population of the students are spanish speaking: they speak spanish inside and outside of the classroom, and I think that is a major problem, especially for students in the ESL program. English language needs to be emphasized both in the classroom and in the hall. If they don’t speak it there, most likely they won’t be practicing it outside of school.